Game for two or more players, each fielding units of warriors drawn from one of the mighty MegaCorporations of Mankind, the Brotherhood or its vile enemy, the Dark Legion. Warzone Resurrection is a fast paced, exciting and tactical miniature game created by Prodos Games Ltd. and Paradox Entertainment. The Warzone Resurrection project brings the tabletop game well and truly into the 21st century. Lovingly, we have taken essence and best bits from the game, art and prose of previous editions to produce all new miniatures, a background re-imagining (by Warzone mega-fan and writing genius, Andy Hoare) and an exciting innovative gaming system. Corporate Warbook is the essence of Warzone 2.0. All of the rules, enriched with background stories and beautiful art make Warbook publication that no Warzone player can miss. 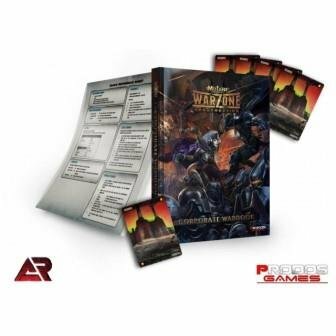 Every book comes also with 8 resource cards and Quick Reference Guide - a short "cheat sheet" with all of the basic definitions and actions listed in compact and handy form - perfect for players who have just started with Warzone Resurrection. It also comes on high quality cardboard paper.